Sulfur is an accumulation of various collaborative experiments since Rachel Carey temporarily moved into Eva Olthof’s studio at Het Wilde Weten for a period of three weeks, with results put on display on Saturday January 21st. HWW disclosed is a new public program initiated by Het Wilde Weten that commenced last summer and will run the upcoming two years. 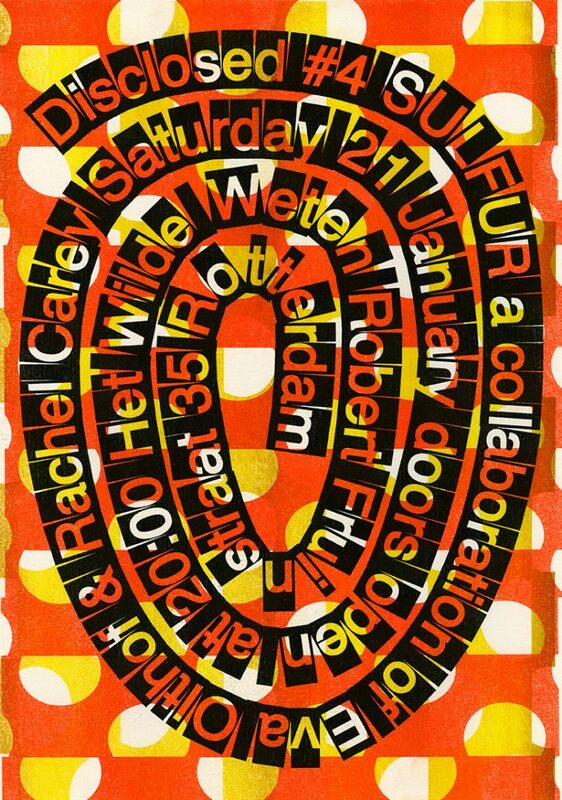 Het Wilde Weten consists of sixteen artist that have a studio in the former nunnery at the Robert Fruinstraat. Every six weeks one of the members will host a public event that derives directly from their artistic practice. This will result in a lively series of talks, exhibitions, screenings, performances and more, disclosing the energy and pluriformity of the collective and creating public moments to meet and interact. Special thanks goes to Team Thursday for the poster design. This program is kindly supported by the Mondriaan Fonds.